The Dakar Dead Drop Fiction project takes as starting point the existing offline file-sharing network called 'Dead Drops', to distribute and reveal the fragments of a collective science fiction story on the future of Dakar, one of Africa's biggest cities. This project was initiated by Catherine Lenoble, French cultural producer and author & Julien Maudet, French game developer from Nantes. It was co-produced and hosted by Kër Thiossane, Villa for Art & Multimedia, organiser of the Afropixel festival. The term 'dead drop' is a nod to spy culture, referring to a secret location where people can exchange messages or objects without having to meet physically. The 'Dead Drop' project was developed by Aram Bartholl at Eyebeam in New York in 2010. As an artist he explores the intersection between the online and offline worlds and the influence of digital technologies on our everyday actions and behaviours. In 'Dead Drops' the locations for the exchange are a multitude of USB sticks, cemented into the walls of buildings, embedded into the city architecture, that anyone can install, and use for dropping or picking up files. The works of Aram Bartholl literally take private digital practices onto the streets. 'I like this image of data literally being inserted into walls, and of people bending over to connect their 3,000 € laptop to the curb to maybe find some files. It inverts the idea of the portable memory stick. The city itself becomes an immobile USB drive that you have to go to it to plug in.' says Bartholl in an interview for Dazeddigital.com. 'I believe that natural corrosion and physical vandalism would be the main killers, that would make dead-drops drop dead.' writes a little cynically a commentator on the Dead Drops blog. Several other blog contributors have pointed that Dead Drops are an easy target for vandalism, illegal content and malware. But Bartholl doesn't see this as a real problem or an obstacle. ' There are viruses out there, on the web, that attack all kinds of machines. We know this, but we feel safe sitting at home with our computers and warm mugs of coffee. Moving this activity to the street makes the danger more obvious. 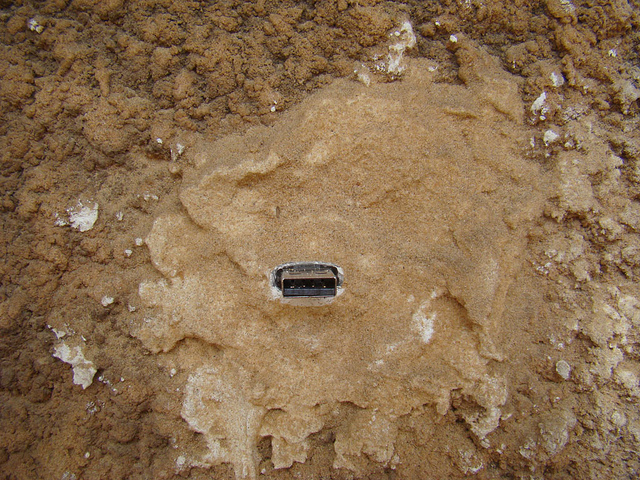 If you want to plug into one of the Dead Drops, you need to protect your machine' explains Bartholl. Bartholl has imagined Dead Drop as a platform for anyone to join. Catherine Lenoble & Julien Maudet, initiators of Dakar Dead Drop Fiction, saw the potential in it and decided to use it, incorporating a completely new dimension to it, 'augmenting it' in the context of Dakar. At the heart of the on-going Dakar Dead Drop Fiction is collective writing on the sci-fi mode and imagining the capital of Senegal in 2050. Africa can be seen as a 'Terra Incognita' in sci-fi terms. 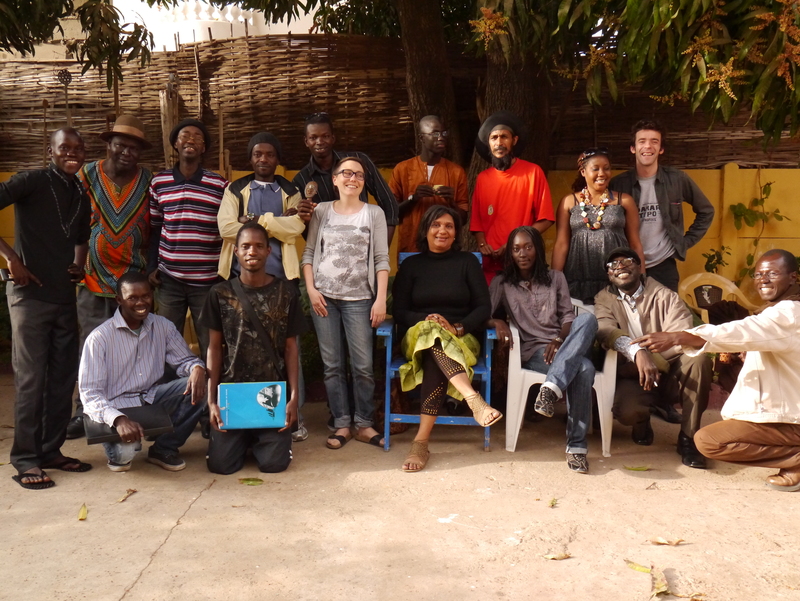 This idea of collective writing exploring the future of Dakar, by rendering the 'intuitions, dreams, doubts and hopes of women and men living in today's Dakar' was the starting point for Catherine & Julien. Fragments of a collective story currently lie on dead drops in 13 locations throughout the city, consisting of text, sound and image files, intertwining French and Wolof. The first phase of this process has been the organisation of a collective writing workshop facilitated by Catherine & Julien. 'The call for participation to the workshop was published in the local papers, which is not a usual way for Kër Thiossane to communicate about their events. During the period preceding the workshop, people from Dakar more than usual were following the news, awaiting a hot presidential election. And this was a perfect time to get people to talk about future.' explain Catherine & Julien. Twenty persons with various backgrounds showed up at first, some familiar with Kër Thiossane, some not, some engaged in artistic practices, some not. 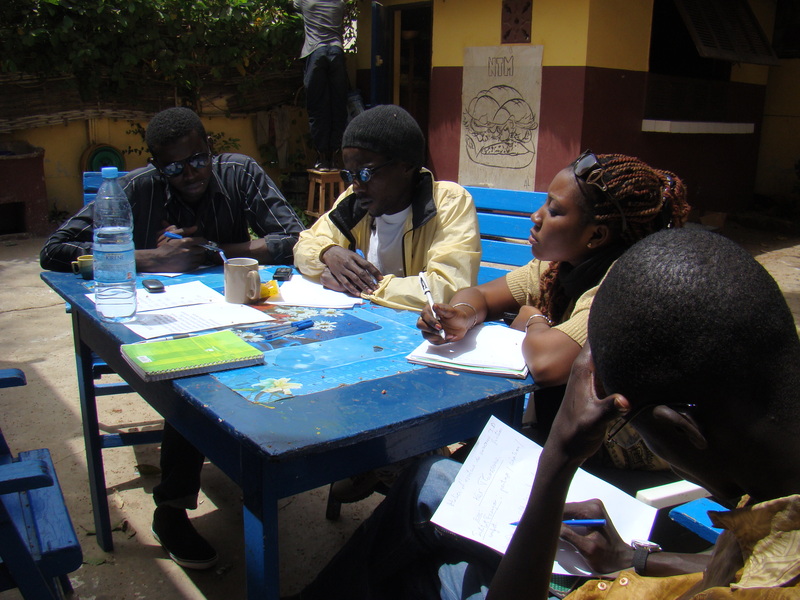 At the end, during 20-29 March, 13 participants aged 20-55 worked on a collective story about 2050 Dakar. The approach for the workshop was to create an horizontal situation where Catherine and Julien saw themselves as facilitators of the participants' expression, rather than teachers. Their strategy was also to combine dimensions of script writing and game, viewing the city as a giant board, unmarked and with multiple entries. Every participant came with 3 locations in mind that where pinned onto a Dakar wall map. The sharing of experiences about these locations was the starting point for the making of the story. From them emerged key words (such as story, water, dream, polemic, saturation, habit, sport, pollution etc.) and themes (such as education/knowledge ; culture/creation ; memory/history ; economics ; community ; space/movement) that were then used to weave a collective meta-fiction in small working groups. These locations were later on imagined deprived from their current characteristics, to let them reveal new future dimensions, using the fiction of opposites as a tool. Finally, characters and scenarios were introduced into the setting. Kër Thiossane is one of the 13 locations in the fiction. Following is a taste of Dakar 2050 envisioned collectively. Story Pitch: '2050, Senegalese wrestling has become a major international sport. Dakar was assigned the title of World Sport Capital, acknowledging the rise of this discipline. Huge renovation projects have been launched throughout the city to welcome millions of visitors. People from Dakar though, are worried about the scale of the financial investment for this immense operation of promotion of sport, which forces transformation upon all kinds of infrastructures. Cultural centers are for instance made to become sport centers or even shops. In parallel the authorities are also implementing a 'Clean City' operation, that threatens the history of various symbolic locations. Extract: From Kër Thiossane to Thiossane Sport Center! Located a few kilometers away from the Demba Diop stadium, Kër Thiossane doesn't exist anymore. It has been transformed into a sport centre 'Thiossane Sport Center', packed from 6 am to 10 pm. However on a Monday of February 2050, people from the neighbourhood decide to rebel. Giss Giss 2050 (2050 Visions in wolof) created in collaboration with Fred Laé, is a publication revisiting the content of the workshop, much like a new chapter towards an open evolving fiction. It was launched at the start of May on the occasion of the Afropixel festival and brings together extracts of texts and a map, inviting the reader to wander around in a 'possible' Dakar. 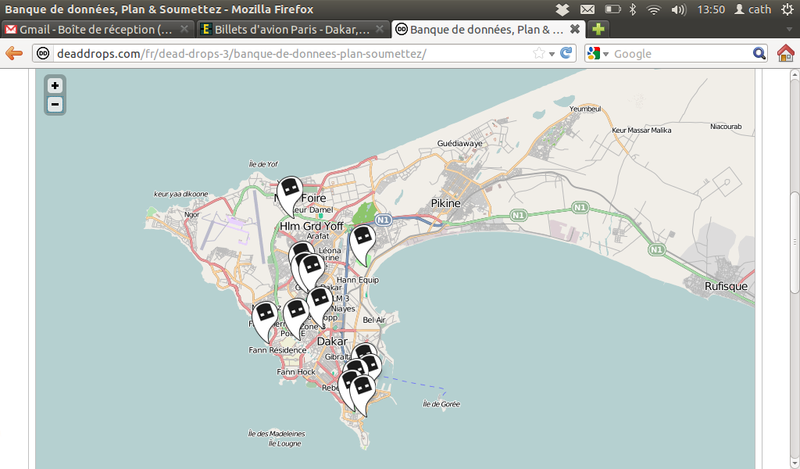 The publication is accessible on all the 13 USB sticks in Dakar and here. One reservation about Dakar Dead Drop Fiction, is the question of the access to the technology involved, especially in the African context. One indeed needs a laptop to actually be able to check out the content of the Dead Drops around the city. This is of course an aspect Catherine and Julien considered. One way for them to solve this, has been to pick locations that are close to a cultural organisation that can make laptops available for people who want to connect to the Dakar Dead Drop Fiction network. Choosing locations next to cultural organisations was a way to give both visibility and protection to the Dead Drops. However, it of course limited the possibility to use more informal locations for the project. 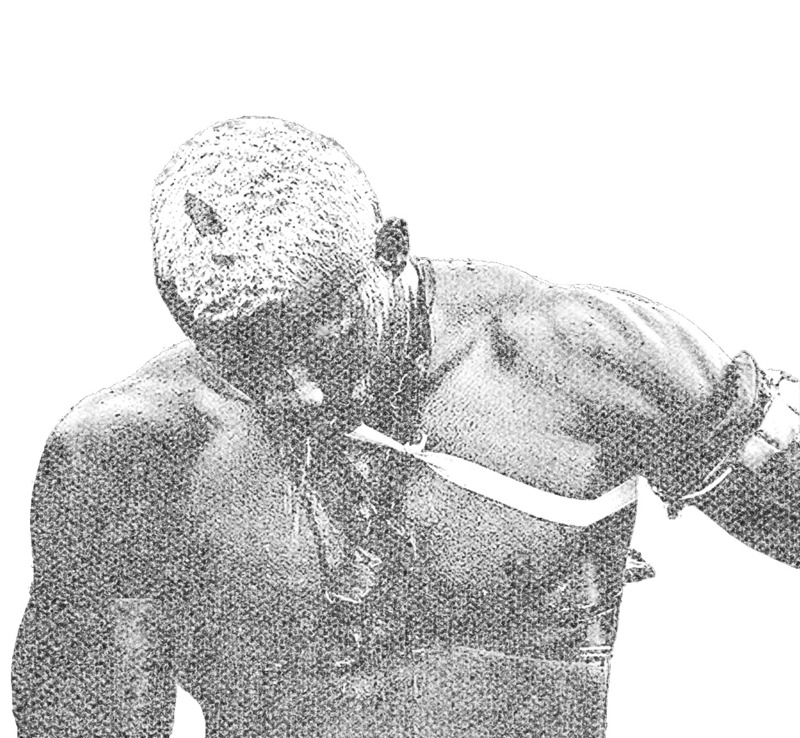 Before Dakar Dead Drop Fiction, there was only 4 Dead Drops in the whole Africa. It's now for time to tell how the story will be continued, augmented, inverted and re-invented. Because the story of writing is connected to the history of devices, with every new type of digital media and related practices emerging around it, writing is evolving and taking on new forms. There is so much to be explored in this area, and Dakar Dead Drop Fiction is a beautiful achievement. One can only hope for increasing experimentation in the crossings of literature, collectiveness and digital tools. Based on an interview with Catherine Lenoble & Julien Maudet.